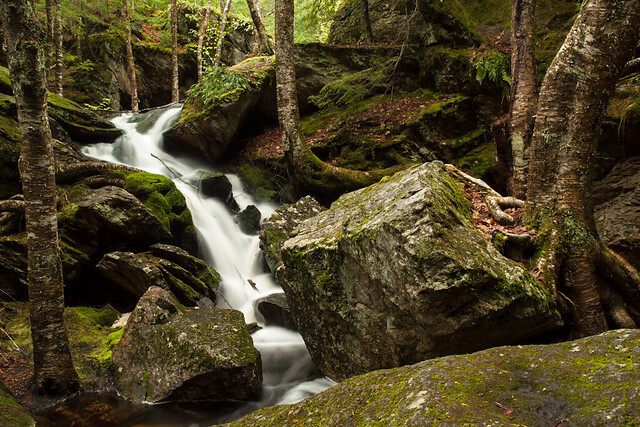 With easy access, trails ranging from easy to moderately difficult and one of the most picturesque brooks in southern New Hampshire, Pulpit Rock Conservation area remains a popular place to connect with nature. The property is named after a rock formation which resembles a pulpit, although I can’t quite see it myself. The gorge carved by glacial melt and Pulpit brook is quite impressive although requires some skill and care to descend and ascend. You will reach it after about 1/2 hour of steady walking from the Kennard trailhead on New Boston Road (marked with white blazes). The rolling path winds through pine and hemlock forest with beeches and other hardwoods sprinkled throughout. There are many small bridges to get you over the wettest parts; small seasonal streams and ponds that eventually drain into the brook. Be on the look out for side trails to the left as you approach the main gorge; these take you to pocket views of a small marsh and a small waterfall. One of them, the Landry trail, has an amazing display of yellow clintonia/bluebead lily. At the top of the gorge there is an information kiosk and map. Directly to your left is the Gott trail (yellow blazes) which brings you over a feeder brook and down to the largest waterfall on the stream. It is steep, but well worth the effort. Another view to smaller cascades lies directly across the granite ledge and also requires some careful climbing. From the kiosk by the top of the gorge you can also choose the Ravine trail (orange blazes) or the Tufts trail (white blazes) and make a loop that takes you through most of the property. Taking Tufts trail from the top of the gorge will bring you through woodland which can get very wet in spring and there is an alternative route marked to keep you out of the water. 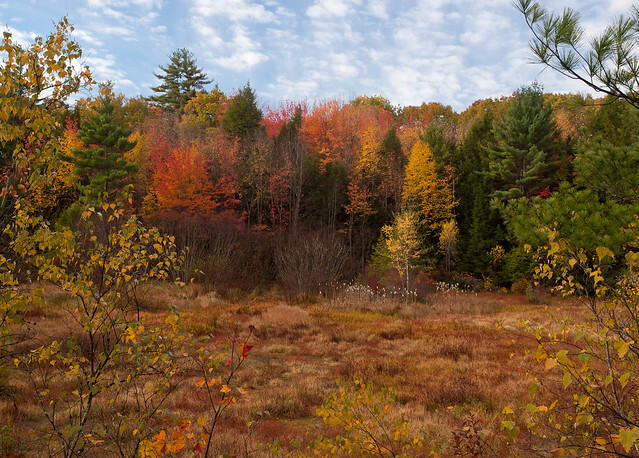 Intersecting Tufts trail is Martin’s trail (yellow blazes) which winds through similar forest to an open meadow. It is an out and back trail. The Ravine trail takes you down to the water and the gorge and leads directly to a second waterfall which is split into two main channels over a large granite ledge. After descending this rocky area you follow the stream closely and there are some lovely cascades and waterfalls to enjoy along the way. Farther downstream the Ravine trail and the Tufts trail meet and the Tufts trail continues to the old Gage sawmill site. While not official, you can continue walking on the nearside of the brook to a small beaver pond. Crossing the brook (there is no bridge so please watch your footing) will lead you to another glacial boulder formation known as Indian Rock. From there you reach the Gage’s Mill trail which is a bit more strenuous and leads to a second (limited) parking are on Pulpit Road. Backtracking from the mill to the intersection of the Ravine trail and Tufts trail will give you two more options. The newest leads to the nearby Joppa Hill Farm which is also open the public and features its own trail network. 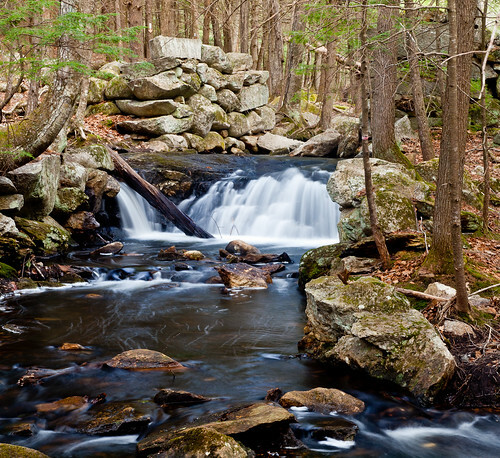 Marked by red blazes is the Campbell trail which brings you steeply along a feeder brook and then through more upland forest. It’s a moderately strenuous trail that loops back to the Kennard trail which will bring you to the main parking area on New Boston Road. At the intersection of Routes 101 and 114, follow Route 114 to the next light and turn left onto New Boston Road (opposite the Market Basket). Follow for several miles until you’re almost at the town border where you will find a parking area and signage on your left at the bottom of a long hill. If you reach Bedford Road, you’ve gone too far. Alternative parking can be found on Pulpit Road where the Gage Mill and Scouting Way trailheads can be found. Hidden to the right just past the sign at the main parking lot on New Boston road are a couple of picnic tables, but you have to look to find them.